This article was originally posted at Climate Progress. View the original post here. To hear its critics tell it, Germany’s ambitious push to switch over to renewable energy has delivered an electrical grid that’s capricious, unreliable, and prone to blackouts. But according to data highlighted by ECO Report last week, the reality on the ground couldn’t be further from that caricature. Specifically, the availability of electricity in Germany was lost only for an average of 15.91 minutes per customer in 2012, according to figures from the Council of European Energy Regulators. That’s far better than the United States, which saw its electricity become unavailable for a whopping 244 minutes per customer in 2008. Germany also did significantly better than the United Kingdom (lost 81.42 minutes per customer in 2008), the Netherlands (lost 33.7 minutes per customer) and France (lost 95.1 minutes per customer). 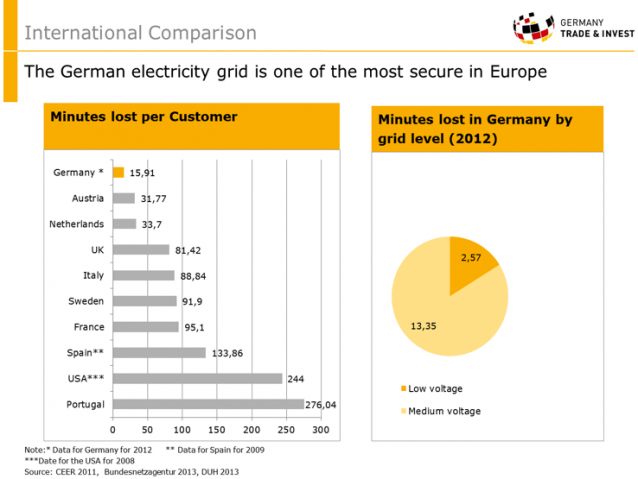 Of all the countries tracked, Japan and Singapore are the only two with grid reliability to match Germany’s. And the country has actually maintained this record for several years: 2008 was the last year in Germany when the amount of minutes lost per customer breached 16. ECO Report pointed to a recent article in Bloomberg as an example of the standard story on Germany. The argument goes that by making a big policy push to move the electrical grid onto to renewables like solar and wind — which produce power intermittently, since no one can control when the sun is out or the wind blows — and by making the purely political decision to phase out its nuclear fleet following the Fukushima disaster, Germany has left itself without the kind of reliable baseload power that can only be provided by nuclear reactors or fossil fuels like natural gas and coal. As Bloomberg points out, Germany’s domestic electricity has become far more dynamic. Twenty of the country’s biggest utilities are now earning fees in the balancing market, an exchange where firms can earn additional profits by pledging to add or cut electricity within seconds to keep the power system stable. That’s double the amount of utilities that were participating in the balancing market just back in September — and the fees provided by the market can pay utilities as much as 400 times what they’d usually earn with wholesale electricity prices. The unspoken assumption, then, is that an electricity system that is constantly switching that rapidly between different electricity sources and providers, with swings that big in price, mustresult in an unreliable experience for the average German consumer. The data from the Council of European Energy Regulators shows that’s not the case. The crazed internal dynamics of Germany’s grid may be stressful for its operators. But the country has managed to stitch all those changes together into a remarkably consistent and reliable stream of electricity for German customers. There’s plenty of precedent for how this could work. 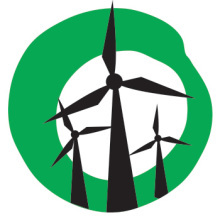 Studies and demonstration projects haveshown that by stitching together a diverse portfolio of renewables, and filling in the gaps with a modest amount of natural gas or coal that can be fired up when needed, grids that rely primarily on renewables can actually provide a level of reliability equal to that of traditional fossil-fuel-dependent grids. For one thing, it’s not completely impossible to predict when wind power, for example, will be available. Operators can generally get a pretty reliable 24-hour notice, meaning they know when to fire up fossil fuel generators to tied the grid over. Another big reason for this is that there are lots of different forms of renewable energy, and their differences can be complimentary. Hydro and geothermal power, for instance, can effectively provide continuous baseload power just as easily as fossil fuels or nuclear. And while solar obviously produces its power in the daytime, much of the wind blows at night — meaning that solar and wind power can, to an extent, naturally compliment one another in terms of when they feed the grid. Germany is certainly not out of the woods yet, however. All the added cost from that switching means Germans face higher electricity prices than their European neighbors along with enjoying a greater level of reliability. And in the short-term, at least, the demands of Germany’s internal switching has driven a modest increase in the percentage of the power it gets from coal, by far its heaviest source when it comes to carbon dioxide emissions. Meanwhile, cleaner sources like nuclear and natural gas have declined. In particular, the country’s decision to shutter its nuclear power out of fears of a Fukushima-like disaster has been a self-inflicted wound on the affordability of Germany’s power supply. But for all that, Germany got one third of its power from renewables in the first half of 2014, a remarkable accomplishment in comparison to its neighbors. For the first time ever, renewables made up more of the grid portfolio than brown coal did. The country also remains committed to the goal of getting 80 percent of its power from renewables by 2050. Assuming that Germany can keep up the pace at which it’s adding renewables and that storage technology advances to the point it can help out more, then many of Germany’s current issues should smooth themselves out.